This is not a brilliant photo but it documents the first time I have seen and photographed a Sparrow in my town. Sparrows are not native to Australia. These birds are one of the many things that early settlers brought with them. I saw Sparrows over at Rainbow Beach when I first came here about nine years ago but at that time there were none right here. I saw these in a friend's yard. Usually there are numbers of Brown Honeyeaters in her yard but now there are either Brown Honeyeaters or Sparrows. These birds don't eat the same things so it is not food competition which is making them uncomfortable in the same yard. It will be interesting to see if they learn to live in close proximity or if one displaces the other. 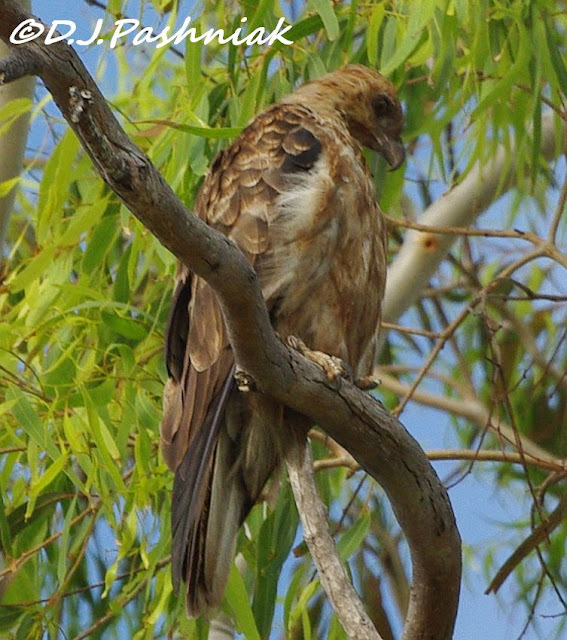 A much more welcome sight was this Whistling Kite which I saw in a large eucalyptus tree on the Crab Creek foreshore. A pair have lived and nested in this area for some time. This bird was high in the tree and it was hard to get a good view of it without branches or leaves in the way. 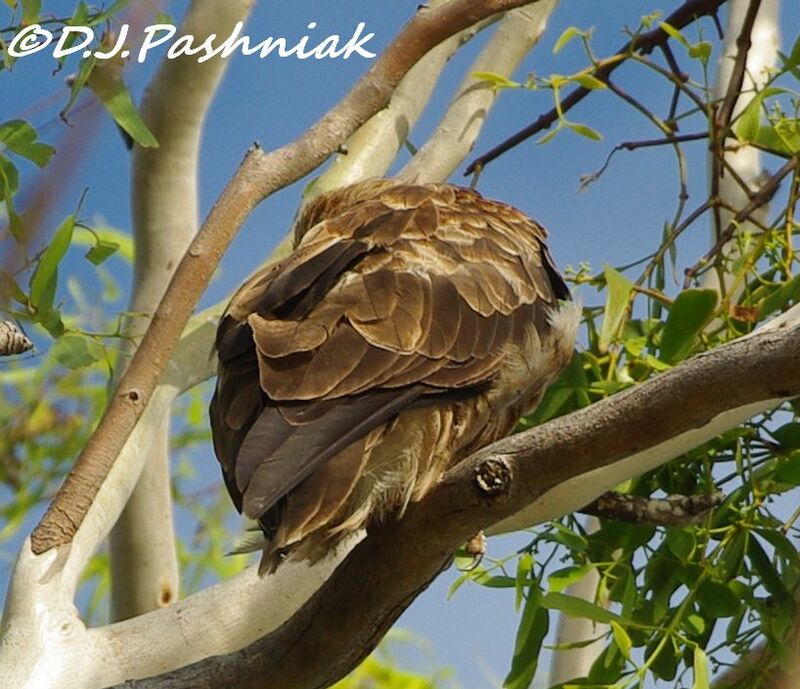 For more bird photos from around the world visit Wild Bird Wednesday. interesting that the sparrows are not frequently seen there. we're beginning to see more eurasian collared-doves in our area. amazing how the species 'invade'. the kite is neat. That Kite looks like a great bird Mick. Interesting about the sparrows. They live here in Sweden too. Like the picture of the kite! It has never occurred to me that sparrows did not live in Australia! We have so many different varieties of sparrows here. One thing I like about blogging is how much you can learn while doing it. Great stuff Mick, cheers to you! A great post for WBW! Those sparrows have invaded the world it seems, they are not native to the US either. But we have tons of them. Love the Kite, cool bird! Great photos. We have more Sparrows than we can count. Great captures of the Kite. Great pictures of the Kite. Fantastic captures of beautiful birds. Nice pictures you show. 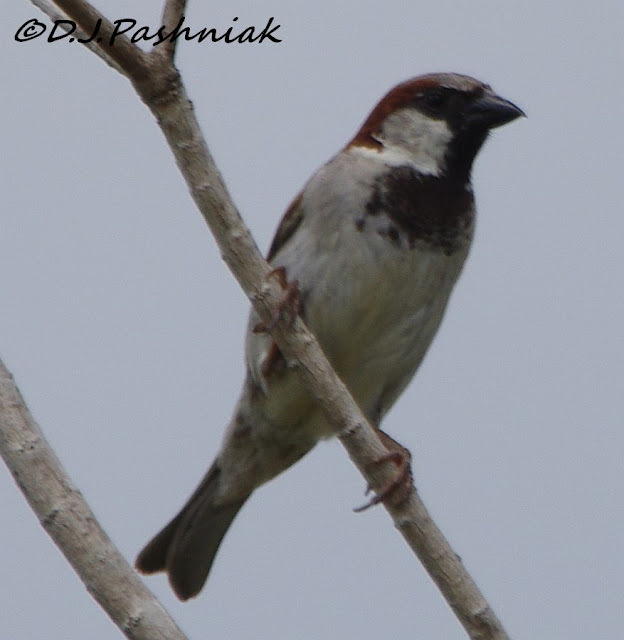 Can see that there are also tree sparrows where you live. Try to introduce Bird A to Bird B. Actually you need a "Sparrowhawk". The real problem is lazy shop-keepers who leave rubbish around, and old corrugated roof buildings where Sparrows can nest easily. Invaders (fauna and flora) are a huge problem here in Florida. Probably some of the same reasons as where you live -- warm, easy living/growing conditions and lots of human invaders (er visitors -- like we are ourselves of course). Many times I will be admiring a flower or bird and then wonder if it is supposed to really be here. It's hard for a novice to tell. Interesting about your sparrow population. Hope it doesn't get out of hand! Wonderful shot of the kite! I see these every day - and tree sparrows once a week or so. Without sounding political - they should go back home!! Cheers and thanks for the link to WBW. What a magnificent bird the kite is! Lovely shot of the layered feathers. Sometimes I look at a photo and wish it was better. I'm learning to appreciate the need to document things regardless so I'm glad you posted the sparrow shot.